The proceedings of a symposium held at the Snite Museum of Art, University of Notre Dame, February 24, 2007 have appeared. at one end of the spectrum the American director of one of the world's great encyclopedic museums, at the other an Italian field archaeologist charged, among other things, with the responsibility of protecting provincial archaeological sites in Sicily from looting. 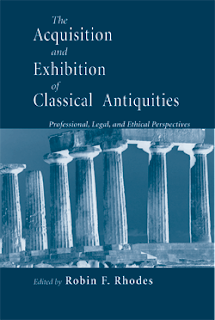 Rhodes argues for "the increasingly important voice of university museum directors, whose constituency and mission inevitably place them in a position of compromise between the encyclopedic museum and the field archaeologist". But did he write too soon given the returns from the Princeton University Art Museum? Malcolm Bell III, Nancy Bookidis, Douglas E. Bradley, James Cuno, Dennis P. Doordan, Patty Gerstenblith, Charles R. Loving, Michael Lykoudis, Joanne M. Mack, Mary Ellen O’Connell, Robin F. Rhodes, Marcia Rickard, Kimerly Rorschach, C. Brian Rose, Charles Rosenberg, Stefano Vassallo, Charles K. Williams II.